You have a website and you're searching for the best licence under the creative commons banner. Which licence would suit your site? Read the about each and every licence, their conditions and some examples of websites/works which have already implemented creative commons. The creative commons have been discussed before, here you’ll find out of the licenses made available by the creative commons, which license would suit you best. The creative commons website has made it clear that there are no registration fees for protecting your work with a creative commons license. 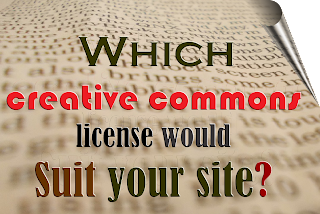 You just need to select which of the six license would suit you most and marking your works so that others know it is protected with a creative commons license. The user will have to cite/attribute you (author/creator) in the works taken from you. Most suited for website/blog/vlog/music content with highly generous authors who do not mind their works to be used for commercial and derived purposes. It is also good for new and first time websites. Repository for teachers on Syria, Read the CC Blog post on the website. The user will have to cite the original author and the same applies to any one who uses the derived work. Most suited for video and blog content with authors who do not mind their works to be used for commercial purposes. However this type of license is most suited for video and music blogs. The user will have to attribute the original author and should not change/modify the works. Most suited for Image creation websites. For example websites or blogs which are into image creation/touch-ups like photoshoped wallpapers, abstract arts, and photography websites. The user will have to attribute the original author and can use it freely without using it for commercial purposes. The author must remember that for such a license the derivative works is not subjected to the same license, i.e. the same license does not apply to the works used from you. Most suited for video blogs or video content creation websites like tutorials, personal videos (wouldn't recommend). Stanford Digital Repository, 47 thesis available under the licence. The user will have to attribute the original author and cannot use it for commercial purposes. Also the same license applies to any derived work at any level. Most suited for written content from blogs with somewhat reticent authors. The licensee/user will have to attribute the original author, without modifying or using it for commercial purposes and the same license is applicable to any work derived. Video blogs or VLogs always use this licence. Most suited for image websites which morph and create images, patterns etc. The author can finally relax that even copies of copies of his work cannot be morphed or edited. Here, derivatives of the work is allowed but the same license will have to be applied to the derivatives, i.e. The derivatives of their work will be allowed under the parent license. Most recommended for photo blogs. The license renders the work with a No Rights Reserved, it has been found that such a license is less ambiguous and can achieve the desired effect on a global scale, rather than limited to some jurisdictions. Note. Just like any official document, there are amendments CC licenses after amendment has an upgrade in its version. As per 2013-14 the version for all licenses available is version 3.0. If you have a licence of a lower version, then you can apply for an upgrade. One thing though, you cannot downgrade your licence, i.e. going back to a lower licence version. If your website is a global website with global needs, you would need un-ported licences. CC offers the same six different licenses based on the international treaties also on copyright. Feel free to comment if you find any other examples of websites implementing cc licences for their content.